I work in arithmetic, and like thinking about algebraic geometry, representation theory and number theory. My CV. (enter at NIKHEF, see below). Galois representations for the general symplectic group (with Sug Woo Shin), available on arxiv. See also video at Luminy, video at IAS, video at IHES. Galois generic points on Shimura varieties (with Anna Cadoret), Algebra and Number Theory (journal, pdf). The trace formula and the existence of PEL type Abelian varieties modulo p, (arxiv). Equidistribution in supersingular Hecke orbits, Journal für die reine und angewandte Mathematik, (journal, arxiv). Combinatorics of the basic stratum, Documenta Mathematica, (journal, arxiv). The basic stratum of some simple Shimura varieties, Mathematische Annalen, (journal, arxiv). Jacquet modules of ladder representations, Comptes rendus de l'Académie des Sciences, (with Erez Lapid), (journal). Spring 2019: Undergraduate course Galois theory (in Dutch). Fall 2018: MasterMath course Commutative Algebra, together with David Holmes. Spring 2018: Undergraduate course Galois theory (in Dutch), together with Gerard van der Geer. Fall 2017: MasterMath course Algebraic Geometry, together with Bas Edixhoven. Spring 2016. Wiskunde 1b, 1c. Linear algebra and calculus for the first year physics program. Fall 2016. MasterMath course Galois representations and automorphic forms, together with Peter Bruin. Spring 2015. Wiskunde 1b, 1c. Linear algebra and calculus for the first year physics program. The Langlands program (slides), Faculty Colloquium, 2018. Andrew Wiles en de Abelprijs (pdf), with Sander Dahmen, Nieuw Archief voor Wiskunde, 2017. Stratification de Newton des variétés de Shimura et formule des traces d’Arthur-Selberg, PhD thesis, Université Paris-Sud, 2013, theses.fr. See also youtube video lecture. Caveat emptor: Galois Representations, Master's thesis, Université Paris-Sud, University of Leiden, pdf. 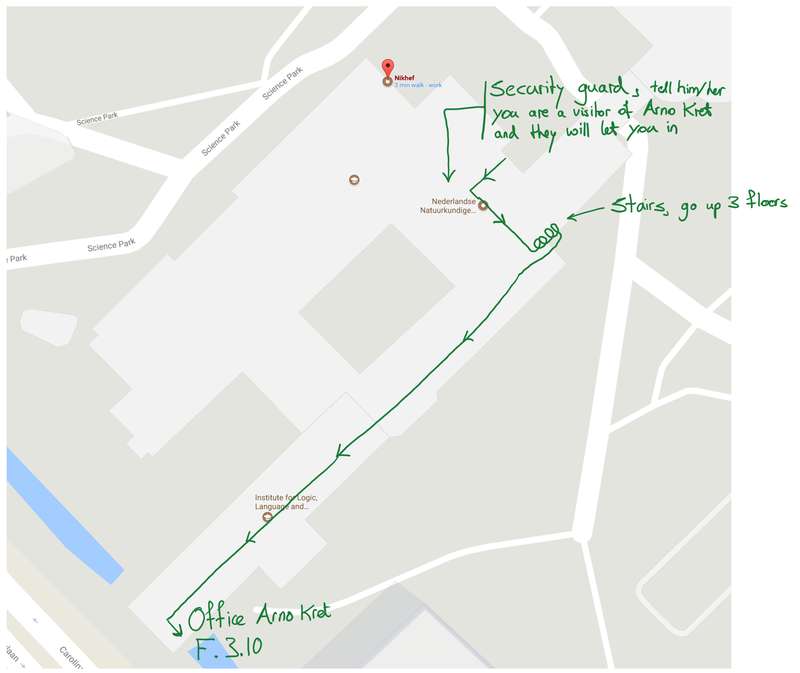 Click here for some instructions to find my office inside the Nikhef building.